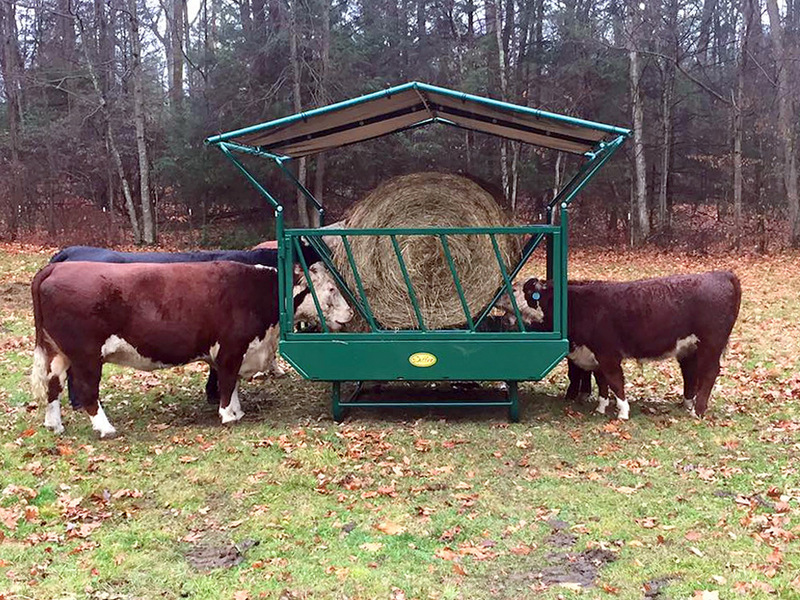 The Diller large hay bale cattle feeder has evolved over the years to the heavy duty more purpose built design it is today. 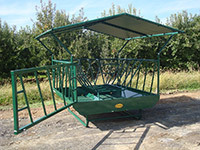 The 8800 series bale feeders are 88" wide and are designed to catch hay that is often wasted as it falls to the ground. 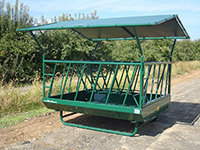 These feeders have a hay basket which holds the bale up off of the pan, allowing your cattle to have a second chance at any hay which is dropped. 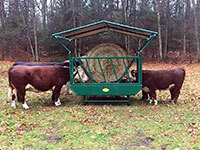 This feature greatly minimizes hay waste so much that some of our customers say their hay waste is zero. Diller hay feeders are constructed of heavy duty schedule 40 pipe and 10 gauge sheet steel and can accommodate large round bales or large square bales. 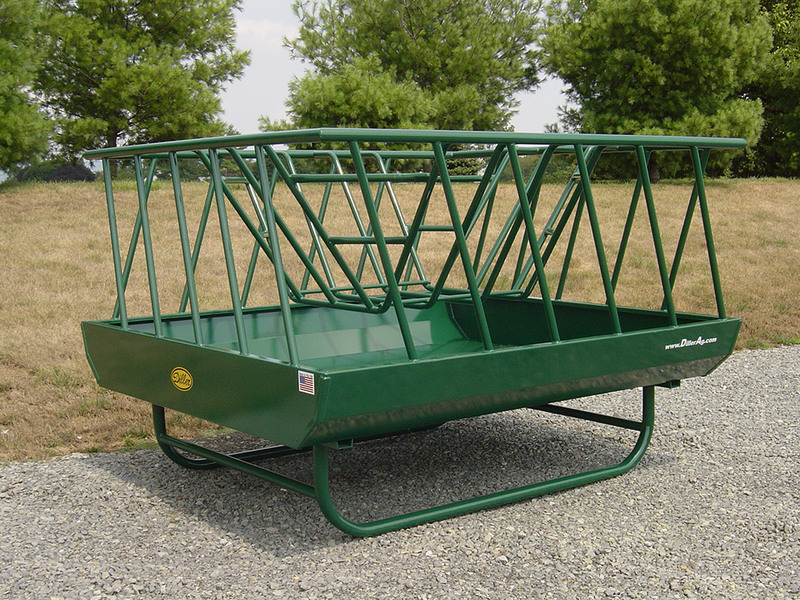 Diller's number one selling hay feeder for cattle year in and out is the HFS-8808C, and is perfect for that small farm or ranch feeding 3-15 head of cattle or a larger operation with multiple feed lots. 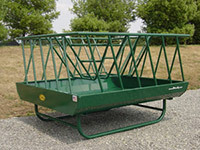 The HFS-8808C is the smallest in the 8800 series of cattle feeders on skids measuring 88" wide by 8' long and will accommodate 1 large round bale in its basket. 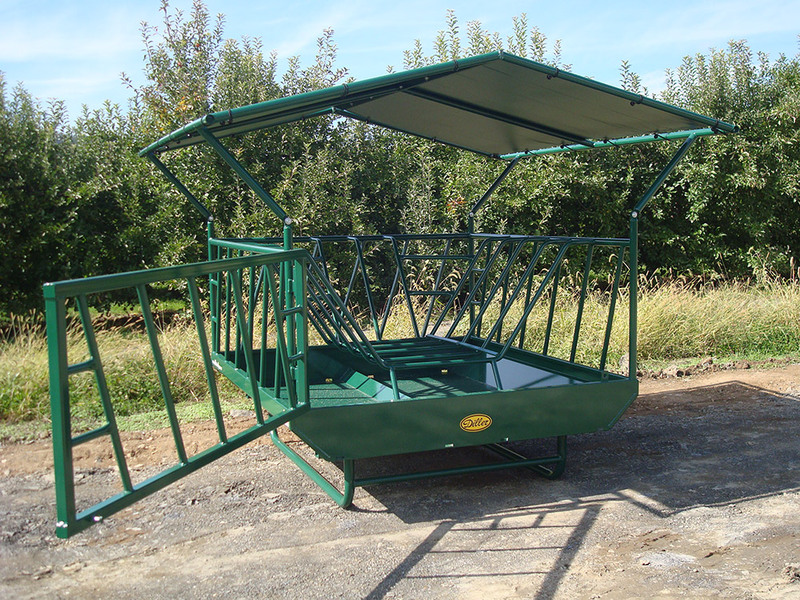 This feeder is now available in several configurations including a deluxe model with a roof to protect the hay from bad weather and a side swinging gate to allow easy loading with a tractor and quick cleanout. For larger herds there is the 12' long HFS-8812 which will accommodate 2 round hay bales or 1 large square bale, and the HFS-8816 at 16' can handle 3 round hay bales or 2 large square bales. 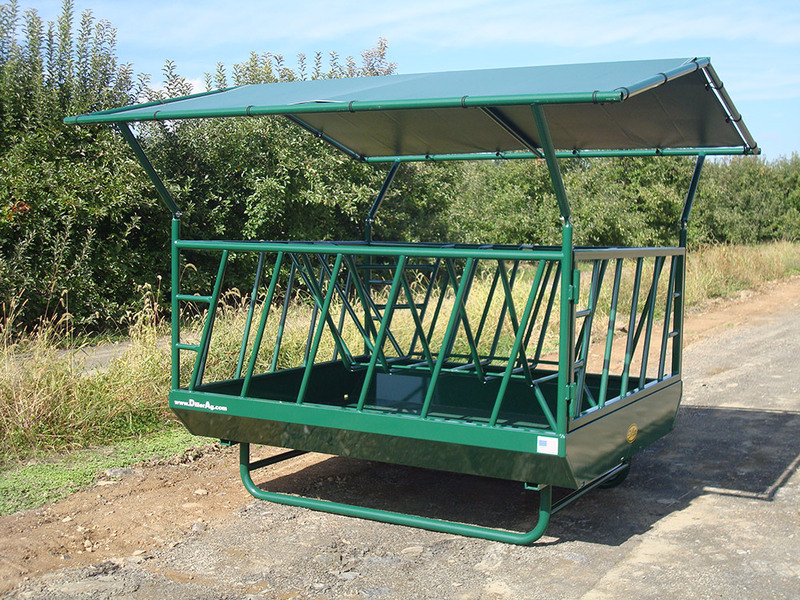 The 8800 series large bale feeders are finished to look new and remain rust free for years. After fabrication, the entire feeder is acid washed to remove any oils, dirt or other contaminants that could prevent paint adhesion. A coat of epoxy primer forms the base of the finish and is topped off with a finish layer of PPG™ two-part polyurethane paint. Due to the "elastic" nature of polyurethane paint it provides a durable finish that resists fading, chalking and chipping unlike many other paints or powder coating. After 26 years of service one of the first cattle hay feeders Lynn Diller built is still in daily use less than a mile from our manufacturing facility. The Diller commitment to quality is the key to this product's longevity and that commitment to quality lives on today at Diller Ag Equipment. 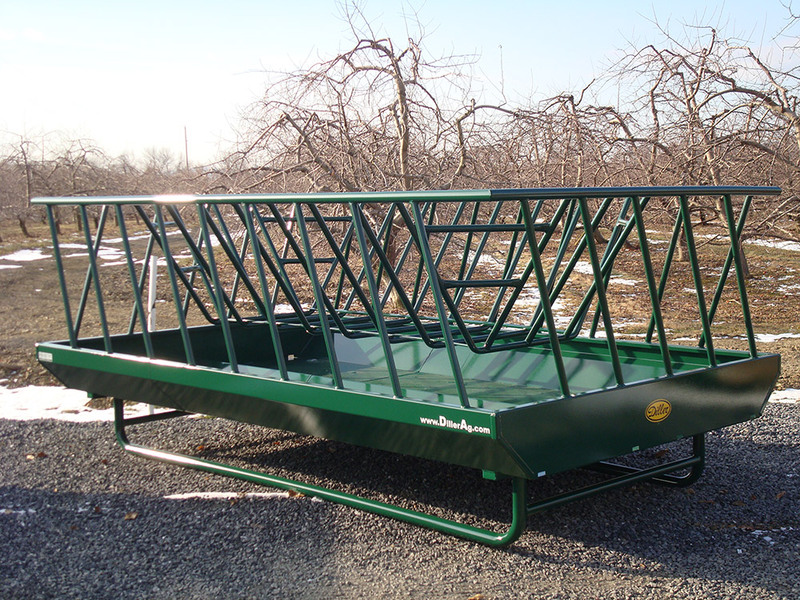 We have only raised the bar on quality and will continue to hold that standard to every feeder, wagon and running gear we put the Diller name on.